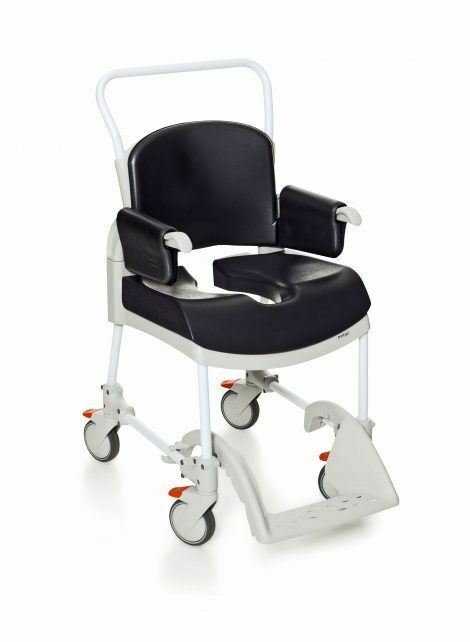 For the immobilised patient, the Clean Comfort Mobile Commode can return comfort and dignity to activities of daily living, without sacrificing mobility or safety. The padded seat, arm rest and back rest are soft and constructed with heat reflecting material. The seat, even with cushions installed, can be used as a shower chair. The commode"s full width is 52 cm, and is 41 cm wide between the arm supports, and 44 cm deep. The seat height is 54 cm without the removable cushion, and 60 cm with the cushion installed. The commode opening is 36.9 cm deep, by 18.2 cm wide. The Clean Comfort Mobile Commode can support user weight of up to 130 kg.